Dusk settles in Laojunshan National Park, China, and a sense of serenity envelops the mountain valleys of Li Ming in western Yunnan Province. In the village below the crack-scarred cliffs, a quiet, self-conscious, pony-tailed American stands alongside a gaggle of big name climbers at the inaugural Li Ming Climbing Festival. Virtually unknown outside China climbing circles, Mike Dobie is more than just the evening’s MC. He is a true pioneer in this part of the world. 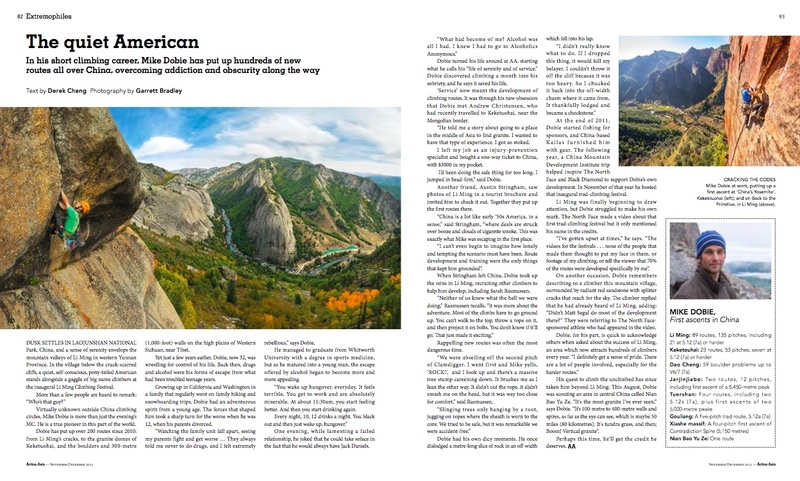 Dobie has put up over 200 routes since 2010: from Li Ming’s cracks, to the granite domes of Keketuohai, and the boulders and 300-metre (1,000-foot) walls on the high plains of Western Sichuan, near Tibet. Yet just a few years earlier, Dobie, now 32, was wrestling for control of his life. Back then, drugs and alcohol were his forms of escape from what had been troubled teenage years. Growing up in California and Washington in a family that regularly went on family hiking and snowboarding trips, Dobie had an adventurous spirit from a young age. The forces that shaped him took a sharp turn for the worse when he was 12, when his parents divorced. “Watching the family unit fall apart, seeing my parents fight and get worse … They always told me never to do drugs, and I felt extremely rebellious,” says Dobie. He managed to graduate from Whitworth University with a degree in sports medicine, but as he matured into a young man, the escape offered by alcohol began to become more and more appealing. One evening, while lamenting a failed relationship, he joked that he could take solace in the fact that he would always have jack Daniels. Dobie turned his life around at AA, starting what he calls his “life of serenity and of service.” Dobie discovered climbing a month into his sobriety, and he says it saved his life. ‘Service’ now meant the development of climbing routes. It was through his new obsession that Dobie met Andrew Christensen, who had recently travelled to Keketuohai, near the Mongolian border. “He told me a story about going to a place in the middle of Asia to find granite. I wanted to have that type of experience. I got so stoked. I left my job as an injury-prevention specialist and bought a one-way ticket to China, with $3000 in my pocket. “I’d been doing the safe thing for too long. I jumped in head-first,” said Dobie. Another friend, Austin Stringham, saw photos of Li Ming in a tourist brochure and invited him to check it out. Together they put up the first routes there. “China is a lot like early ’50s America, in a sense,” said Stringham, “where deals are struck over booze and clouds of cigarette smoke. This was exactly what Mike was escaping in the first place. When Stringham left China, Dobie took up the reins in Li Ming, recruiting other climbers to help him develop, including Sarah Rasmussen. Rappelling new routes was often the most dangerous time. Dobie had his own dicy moments. He once dislodged a metre-long slice of rock in an off-width, which fell into his lap. with gear. The following year, a China Mountain Development Institute trip helped inspire The North Face and Black Diamond to support Dobie’s own development. In November of that year he hosted that inaugural trad-climbing festival. Li Ming was finally beginning to draw attention, but Dobie struggled to make his own mark. The North Face made a video about that first trad-climbing festival but it only mentioned his name in the credits. “I’ve gotten upset at times,” he says. “The videos for the festivals . . . none of the people that made them thought to put my face in them, or footage of my climbing, or tell the viewer that 70% of the routes were developed specifically by me”. On another occasion, Dobie remembers describing to a climber this mountain village, surrounded by radiant red sandstone with splitter cracks that reach for the sky. The climber replied that he had already heard of Li Ming, adding: “Didn’t Matt Segal do most of the development there?” They were referring to The North Face- sponsored athlete who had appeared in the video. His quest to climb the unclimbed has since taken him beyond Li Ming. This August, Dobie was scouting an area in central China called Nian Bao Yu Ze. “It’s the most granite I’ve ever seen,” says Dobie. “It’s 100-metre to 400-metre walls and spires, as far as the eye can see, which is maybe 50 miles (80 kilometres). It’s tundra grass, and then; Boom! Vertical granite”. Perhaps this time, he’ll get the credit he deserves. This entry was posted in climbing, dirtbag dispatches and tagged climbing in china, li ming, liming, mike dobie. Bookmark the permalink.